A material designed by MIT chemical engineers can react with carbon dioxide from the air, to grow, strengthen, and even repair itself. The polymer, which might someday be used as construction or repair material or for protective coatings, continuously converts the greenhouse gas into a carbon-based material that reinforces itself. 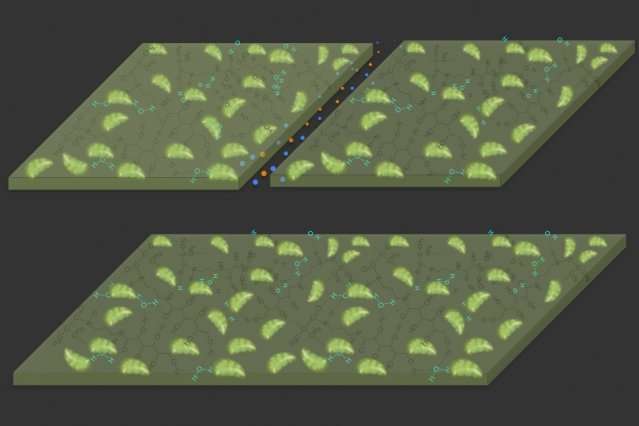 The current version of the new material is a synthetic gel-like substance that performs a chemical process similar to the way plants incorporate carbon dioxide from the air into their growing tissues. The material might, for example, be made into panels of a lightweight matrix that could be shipped to a construction site, where they would harden and solidify just from exposure to air and sunlight, thereby saving on the energy and cost of transportation. "This is a completely new concept in materials science," says Strano, the Carbon C. Dubbs Professor of Chemical Engineering. "What we call carbon-fixing materials don't exist yet today" outside of the biological realm, he says, describing materials that can transform carbon dioxide in the ambient air into a solid, stable form, using only the power of sunlight, just as plants do. Developing a synthetic material that not only avoids the use of fossil fuels for its creation, but actually consumes carbon dioxide from the air, has obvious benefits for the environment and climate, the researchers point out. "Imagine a synthetic material that could grow like trees, taking the carbon from the carbon dioxide and incorporating it into the material's backbone," Strano says. The material the team used in these initial proof-of-concept experiments did make use of one biological component—chloroplasts, the light-harnessing components within plant cells, which the researchers obtained from spinach leaves. The chloroplasts are not alive but catalyze the reaction of carbon dioxide to glucose. Isolated chloroplasts are quite unstable, meaning that they tend to stop functioning after a few hours when removed from the plant. In their paper, Strano and his co-workers demonstrate methods to significantly increase the catalytic lifetime of extracted chloroplasts. In ongoing and future work, the chloroplast is being replaced by catalysts that are nonbiological in origin, Strano explains. The material the researchers used, a gel matrix composed of a polymer made from aminopropyl methacrylamide (APMA) and glucose, an enzyme called glucose oxidase, and the chloroplasts, becomes stronger as it incorporates the carbon. It is not yet strong enough to be used as a building material, though it might function as a crack filling or coating material, the researchers say. The team has worked out methods to produce materials of this type by the ton, and is now focusing on optimizing the material's properties. Commercial applications such as self-healing coatings and crack filling are realizable in the near term, they say, whereas additional advances in backbone chemistry and materials science are needed before construction materials and composites can be developed. One key advantage of such materials is they would be self-repairing upon exposure to sunlight or some indoor lighting, Strano says. If the surface is scratched or cracked, the affected area grows to fill in the gaps and repair the damage, without requiring any external action. While there has been widespread effort to develop self-healing materials that could mimic this ability of biological organisms, the researchers say, these have all required an active outside input to function. Heating, UV light, mechanical stress, or chemical treatment were needed to activate the process. By contrast, these materials need nothing but ambient light, and they incorporate mass from carbon in the atmosphere, which is ubiquitous. The material starts out as a liquid, Kwak says, adding, "it is exciting to watch it as it starts to grow and cluster" into a solid form. "Materials science has never produced anything like this," Strano says. "These materials mimic some aspects of something living, even though it's not reproducing." Because the finding opens up a wide array of possible follow-up research, the U.S. Department of Energy is sponsoring a new program directed by Strano to develop it further. "Our work shows that carbon dioxide need not be purely a burden and a cost," Strano says. "It is also an opportunity in this respect. There's carbon everywhere. We build the world with carbon. Humans are made of carbon. Making a material that can access the abundant carbon all around us is a significant opportunity for materials science. In this way, our work is about making materials that are not just carbon neutral, but carbon negative."